Due to the difficulty in cutting spodumene, given its inherent cleavage planes, it is rare to see such a large example of this pink variety, known as kunzite—much less to see one which possesses such excellent clarity and luster. 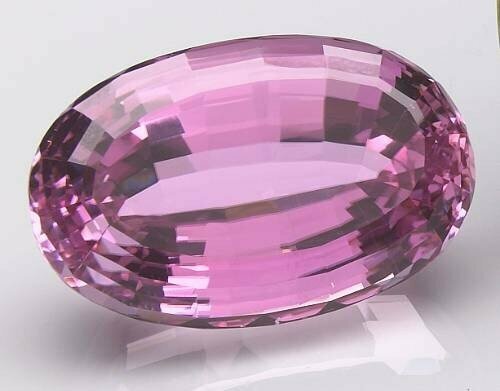 This oval-cut gem displays a rich pink color, unmodified by any ancillary hues such as brown, commonly seen in this material. The vibrant, well-saturated hue, as well as the size makes this stone worthy of consideration by the most serious collector.